Wing expanse 18-27.5 mm. 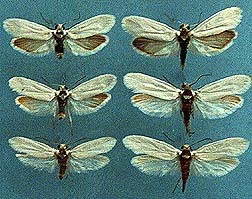 Forewing wide and blunt, usually white but occasionally with more or less tan coloration in northeastern part of range. Hindwing medium to light brownish grey, darkest by apex, gradually turning white toward hind corner. Moth generally lighter in southern populations. Female with fully developed maxillary tentacles. Male genitalia with aedeagus 1.4-1.9 mm long, 0.0357-0.040 mm in cross section; female genitalia with posterior apophyses 5.0-6.9 mm long, corpus bursae with signa 0.95-1.20 mm in diameter. Similar to many species in the yuccasella complex, especially the largely sympatric intermedia and cassandra, but intermedia females lack functional maxillary tentacles, and yuccasella has a lower dorsal keel on the ovipositor than either species. Genitalic characters are helpful in obtaining a definitive identification. A diagnostic key is provided. 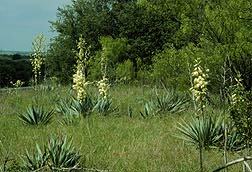 The species is known from the capsular-fruited yuccas Yucca filamentosa (Y. smalliana, Y. flaccida), Y. glauca (Y. arkansana), Y. constricta, Y. rupicola. Y. pallida, Y. reverchoni, and Y. aloifolia (Pellmyr 1999). Females oviposit into young fruit. Eggs are laid inside the ovary, between the locule wall and the ovules. The larva feeds on developing seeds. Pupation occurs in a cocoon in the soil. Throughout the Great Plains from its southern boundary in Texas to southernmost Canada, and in all regions east of the plains northward at least to central Michigan, southern Ontario, and Connecticut. The range has expanded in the northeast through colonization of Y. filamentosa after it became widely cultivated by European settlers in the past 150 years. 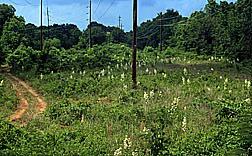 Natural habitats include sand dunes, pine forest and glades in the east, and grassland elsewhere. Altitudinal range 0 - 1920 m.
Shrubland in Comanche Co., Texas, and a cleared area in Lowndes Co., Mississippi, represent typical habitats of host yuccas. Pellmyr, O. 1999. Systematic revision of the Tegeticula yuccasella complex (Lepidoptera: Prodoxidae) north of Mexico. Systematic Entomology 24:243-271. Tegeticula yuccasella female in the process of actively pollinating a Yucca filamentosa flower. Page: Tree of Life Tegeticula yuccasella (Riley). Authored by Olle Pellmyr. The TEXT of this page is licensed under the Creative Commons Attribution-NonCommercial License - Version 3.0. Note that images and other media featured on this page are each governed by their own license, and they may or may not be available for reuse. Click on an image or a media link to access the media data window, which provides the relevant licensing information. For the general terms and conditions of ToL material reuse and redistribution, please see the Tree of Life Copyright Policies.